If you are experiencing foot pain, ankle pain, or heel pain, our knowledgeable podiatrists and sports medicine experts at Dallas Podiatry Works know how to evaluate and diagnose your condition to help you get back on your feet as quickly as possible. We offer state-of-the-art podiatry care in Dallas, TX, for injuries ranging from ankle sprains to foot fractures to plantar fasciitis. Whether you have a sports-related injury or are having heel pain during your daily activities, we can help. Sometimes, patients with sports related injuries or chronic foot pain put off their visit to the podiatrist, because they fear that surgery is the only option. Don’t let fear keep you from seeking treatment! Our expert podiatry team at Dallas Podiatry Works has numerous non-invasive ways to treat injuries such as plantar fasciitis, and we believe in approaching care conservatively. 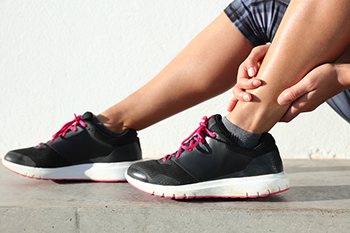 To ensure fast healing and prevent recurrent injury, have your foot, ankle, or heel pain promptly evaluated and treated by our sports injury specialists at Dallas Podiatry Works. For 5-star-rated podiatry care in Dallas, TX, call our podiatry office at 972.566.7474 or click here to schedule an appointment today.